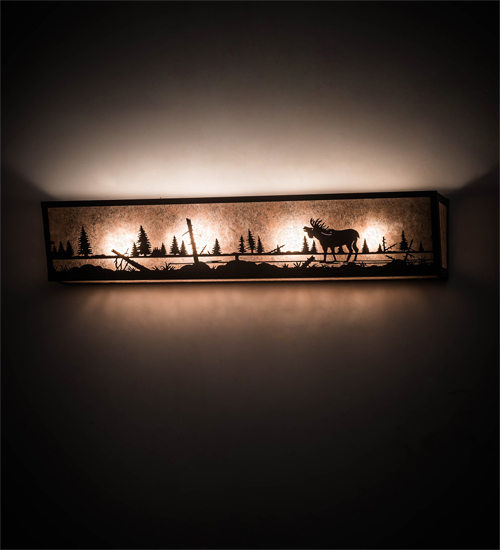 Description: The majestic Moose meanders alongside a woodland lake as ambient light projects from a stunning Silver Mica lens. The Brass frame and hardware are hand-finished in Craftsman Brown. Ideal for a vanity light for a fine bath or as a wall sconce to illuminate hallways and other spaces. The wall fixture is handmade by highly skilled artisans in our 180,000 square foot manufacturing facility, at the foothills of New York's glorious Adirondack Mountains. Dimmable energy efficient lamping options are available. Custom styles, colors, and sizes are offered. The 31-inch wide fixture is UL and cUL listed for dry and damp locations.